Quizzes to discover which Hobbit you’re most like…videos of grumpy Great Danes. Facebook can be a massive time and brain cell drain. But one Facebook activity making the rounds has users challenging each other to share a list of positive things in their lives or things they’re thankful for. Lots of people in my Facebook circle took part over the last week, expressing gratitude or thankfulness for people or situations. It’s always good for any of us to take time to reflect on what brings us peace, joy, comfort, laughter, and so on. And as cool as it is that so many are posting a gratitude list on Facebook, it’s also super-important to thank the people in our lives in a personal way. That’s where old-school handwritten notes come in. 1. Pick a person, any person. 2. Get pen & paper. If you only have time to shoot off a quick email thank you, that’s better than nothing…but there’s something to be said for handwriting a note and sending it snail mail. No need for frilly personalized stationery or special pens—I mostly use note cards and colored pens bought at Target or Walmart. 3. Write like you speak. Sometimes folks don’t write because they stress out about their writing skills. 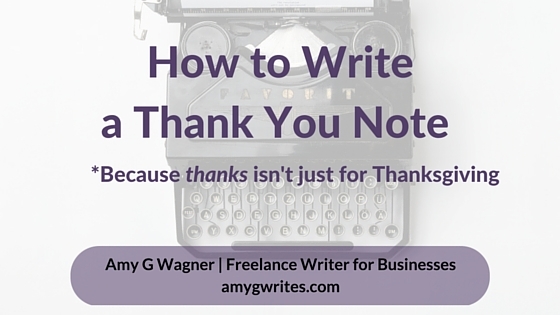 Penning a thank you note has little to do with whether you know how to use a semicolon and everything to do with letting a person know that you value them. Unless you’re a news producer sending thanks to The Royal Family for getting pregnant again, forget stuffy language. Imagine you’re speaking to that particular person face-to-face, and then write those words. That means if you have the kind of relationship where you can say “You’re awesomesauce because…” then that’s the perfect way to start. Just be you. Don’t worry about writing a 5-paragraph essay either. Even 2-3 sentences will get your point across and make the recipient feel warm and fuzzy. It’s easy to get tangled up in all the things we HAVE to do, whether your task is blog writing for clients or wrangling the kids into the car. But life is short–so take just a few minutes and tell a fellow human being that they matter.